Was $199.99 You save $114.00! A little birdie told us that kayaking is better than therapy, so grab a friend and spend a day out on the water with this Intex Explorer K2 2 Person Inflatable Kayak Set. Escape to the water with this sporty, inflatable kayak. Made of rugged vinyl material, it's study and game for exploring lakes and mild rivers while you paddle comfortably sitting on the inflatable seats and backrests. The I beam floors, grab lines, grab handles, removable skeg, and streamlined design give you stability and convenience. 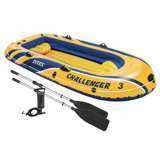 This kayak includes 2 aluminum oars and an Intex high output air pump for easy inflation and deflation. Being lightweight and compact makes it easy to assemble and allows you to take it with you wherever you paddle in life. 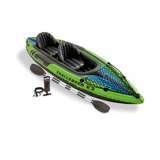 Everyone has something to believe in, and we believe that you should go kayaking with this Intex Explorer K2 2 Person Inflatable Kayak Set because life is good out on the water. This has been by far the best inflatable i have purchased. 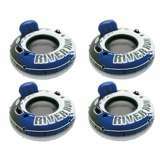 I have used it on lakes and on shallow open waters and have a great response from it. Seats are comfortable but straps are too thin for the size of the back seat. The paddle is ok for a normal pleasure trip but if you intend to do great distances you need a more efficient one. It is a bit heavier than you'd like. It needs a couple rings on the sides to attach things. I have added a couple ropes on the sides so i can attach lines and hold small bags and stuff. It is very stable, on flat water you don't have to worry about falling down, it won't happen (if you are seated) and works fine in small waves at the open shore. However it is not as sturdy as you could wish, but for it's price you couldn't ask for more. Really easy and quick to inflate and deflate. For it's price is the best inflatable kayak you could buy. Bought for use at a retreat center that has an 8 acre lake. All ages use it. Easy to take to and from water. Some of our groups take trips to rivers and other outdoor settings. Have not yet tried product in these settings. I had this shipped to the Keys for my vacation and it arrived right on time. It only took 5 minutes to assemble and start using. Works great I don't think you could ask for any more for the money. Easy to assemble, works well, easy to store. We use the kayaks to explore the mangrove tunnels and coves. We are also considering using them for fishing the flats of the river bays and the gulf of mexico. This is one of the best investments that I have made. looks and seems quality. can't wait to get it in the water. My son and I were very excited to buy a kayak, I bought this one because we wanted a kayak for 2 person. 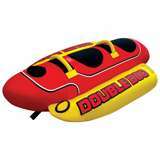 It is perfect, very easy to inflate and ready to go. This kayak is exactly what I was looking for. It can hold my boyfriend and I but it also works for one person. I love that it is not hard to set up but it does give you a nice arm work out. You are going to be paddling anyways so I see it as a warm up. I tried it at two different mountain lakes with no motorized boats and it was great! I never felt like it was going to sink and it feels solid. I like that it comes with the oars as well. The only con I can think of is the bag ripped on me right away and the zipper broke off.